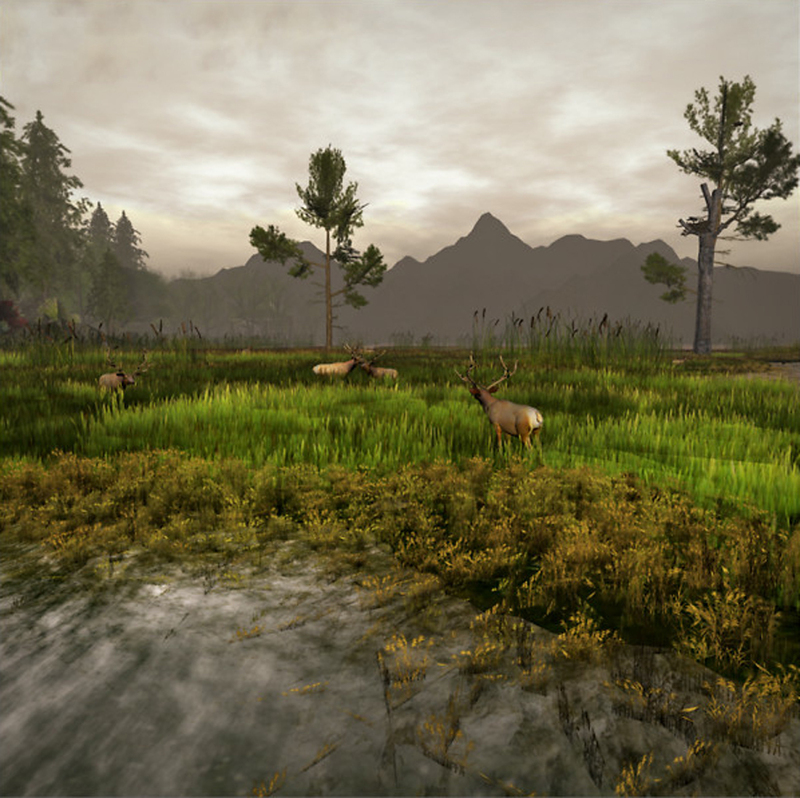 When it comes to beautiful settings in Second Life, few destinations come close to the ten-sim collection known as Calas Galadhon — in my opinion this is the closest thing Second Life has to a VirtualNational Park. What sort of gardening inspiration might you find here? Gorgeous saltwater marshes in the Gulf of Lune (photo above), beautiful pastures and meadows on Dimrill Dale and Glanduin (where our photos were taken), and a large, well-appointed log lodge on Eryn Vorn. Love to ride horses in Second Life? Check out the extensive equestrian trail network on Mirromere or the sunlit forest paths of South Farthing. Prefer a more Asian setting? Visit the private tea pagoda in the Misty Mountains, and when you’re finished, check out its glowing caves, secluded cabins, or the sleeping bag for two. Every one of these sims is characterized by countless thoughtful details, hidden getaways, and abundantly located dance rezzers that will make you want to return again and again. (Note: these slurls bring you to a central landing point; upon arrival, look for the red beacon and head that way to find the spots I’ve described). DBD / Destiny Blue Designs (Alexith Destiny) – one of the nicest plant designers in SL, with a passion for horticulture (in both lives) that inspires him to create all sorts of tropical and wild flowers he’s admired in his travels. This store specializes in 1 prim plants — entire fields of beautiful flowers, rows of bushes, and even large groups of trees — all at just 1 prim! I’ve been holding off on making this post in hopes that one of the stores, from which several basic clothing items came, would return to Second Life. Sadly, Kurotsubaki’s main store sim location (Drowsy) is still covered with plywood prims. My apologies for featuring an outfit that includes several (currently) unavailable pieces! | Rope Belt with Dandelion Bucket | SG / Severed Garden (Berta Avro): Belt + bucket, part of the Olga outfit (in turquoise). This outfit includes skimpy shorts, a falling down top, boots, arm and leg straps, the watering can backpack, and the gardening accessory belt. The belt features a pail full of dandelions with a poofer of dandelion seeds that float around your avatar, along with a small green pouch of seeds, colorful flexi rags, and a few vines and beads for trim. | Leather Belt with Garden Tool Pouch | MMGraffiti’s (Masomaso Quan): Brown Suspenders Belt + Gardening Scissors Bag (the non-wide version). This nicely textured, wide leather belt features two leather suspender straps that hang over each hip, and a leather pouch on my right hip that is click-to-change with 12 colors. Inside the pouch are all sorts of great gardening accessories, including a small spade, some hand tools, scissors, seed packets, and a leafy green sprout. Included in the package is a huge, adorable ladybug “back pack” (which I did not wear). These belts are located on the upper level of the two story open building towards the north side of the sim. | Straw Belt with Goldfish Pouch | Concrete Flowers (Lynaja Bade): Straw Fannypack in “goldfish” design. This features a beautiful woven straw pouch on a woven straw belt, with a lovely asian-inspired goldfish design on the top flap (this design was a group gift; others are available). | Optional Belt | Kawaii (Ravenlynn Templar): Spring Fling – Garden Belt. I couldn’t squeeze any more accessories around my little Neko waist, but I still wanted to recommend this belt. For just $1L, it features all sorts of small flower pots, a shiny metal watering can and spade, and a side cup filled with seeds and hand tools, on which a butterfly (whose wings flap if you click on them) is catching a ride. | Tail | Blueseed (Sala Lowey): Kitty black tail and ear set. I only wore the tail, which has a glowing click-to-change color band; both the ears and the tail are decorated with nice sculpty leaves. The inside of the ears have a blue cyber glow, which is why I chose not to wear them with this outfit. The tail is nicely textured and features a gentle wagging/twitch movement. If you’d like to try an alternate tail, check out SW / Simply Whimsey’s Springtime Garden Tail, which features a small rabbit with a crate full of carrots. 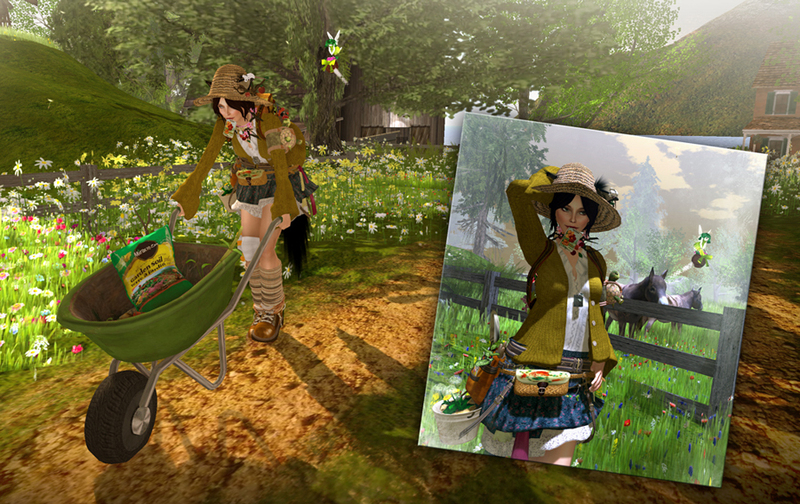 | Garden Wagon | Bug Tussle (Ravenlynn Templar): Garden Pose Wagon – only $1L and 2 poses included! ~ by Stacia Villota / Virtual Neko on April 28, 2011. Beautiful … like a painting beautiful.